Louie and Co. Aim to Brighten Holiday Season for Families in Need. BOWIE, Md. 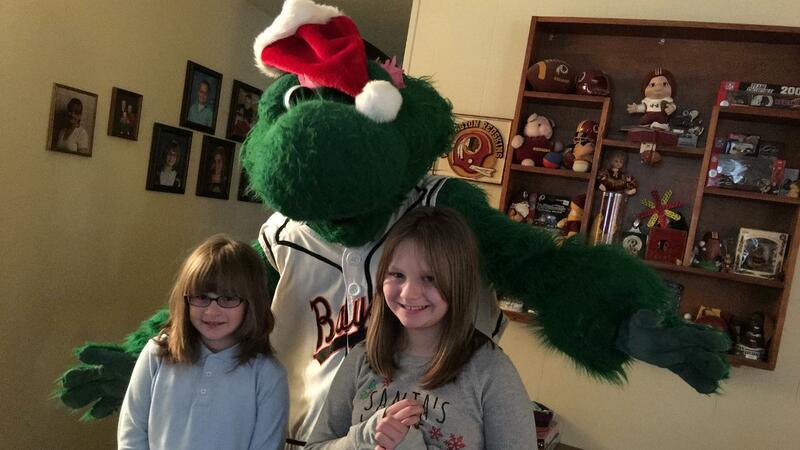 - The Bowie Baysox announced on Monday morning that Louie's Holiday Hope Project returns to brighten the holiday season for local families in need this year. Beginning now and continuing through early December, the team will be accepting nominations for families that need assistance this holiday season. The Baysox will also be collecting gently used coats, new socks and other warm clothing to be donated to area families. Louie's Holiday Hope Project began in 2007 and aided dozens of area families and children last year. This year, the team is proud to partner with the Prince George's County Fire/EMS department, the Bowie Police Department, DeCaro Doran, LLP, and Bowie Youth & Family Services to help as many families as possible. "We've partnered with the Louie's Holiday Hope Project for the last several years and have been impressed with all that the Baysox have done to make the holiday special for so many Bowie families. Without this assistance, many area parents would not be able to prepare a special meal or provide gifts for their children" said Wendy Wilcox, Executive Director of Bowie Youth and Family Services. The Baysox welcome help from our fans in order to reach as many families as possible and members of the community can nominate families that need assistance by e-mailing info@baysox.com. All submissions must include your name and phone number and will be accepted until 5 p.m. on Monday, December 3. Prince George's Stadium will also serve as a collection point for warm clothes and sock donations in conjunction with Louie's Holiday Hope Project. The team invites fans to bring gently used winter coats, new socks and other warm clothing to the Baysox front office during regular business hours (Monday-Friday, 9 a.m. to 5 p.m. through Friday, November 30) to donate to local families in need. The Bowie Baysox 2019 season is presented by Money One Federal Credit Union. The Baysox will return in 2019 to celebrate their 27th Season and season ticket packages are now on sale at baysoxshop.com. The team's 2019 home opener will be Thursday, April 11 against the Harrisburg Senators at 6:35 p.m. To keep up with Baysox news during the offseason, visit www.baysox.com and be sure to follow the Baysox on Facebook, Twitter and Instagram.